Whether you live in a hot, dry desert area or in the freezing arctic zone, the scientifically tested DAMPITS humidifier will protect your instrument against damage. 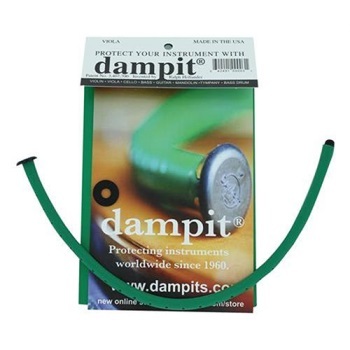 The original humidifier for string instruments, DAMPIT has been protecting wood instruments for over 40 years. Invented and patented in 1966 by profesional violinist and composer, Ralph Hollander, the DAMPIT has protected the instruments of thousands of musicians worldwide. The DAMPIT is the most economical, efficient and time-tested system for keeping your instrument properly humidified. Other systems claim to maintain humidity levels but will not raise humidity under dry conditions. The DAMPIT does both which prevents cracks and restores damaged wood. Long-lasting and easy to use. The DAMPIT is made of the finest materials. With proper care your DAMPIT will give you years of good service without needing frequent replacement. Used for over 40 years by world-class musicians. Because of the unmatched reliability of the DAMPIT, musicians all over the world have trusted it to protect their precious instruments.